TACKLE – Targeted Access to Community Knowledge, Linkage to treatment and Education for HIV/HCV in people of color (TACKLE HIV/HCV in people of color) is a multifaceted program to improve prevention, care, treatment and c/ure of HCV in people living with HIV (PLWHIV) in South Texas. CLICK HERE. 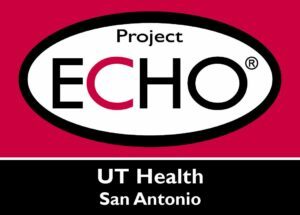 ECHO® – SAAF is a proud partner with UT Health San Antonio’s Project ECHO®, Extension for Community Healthcare Outcomes. We are one of several healthcare providers and healthcare workers in underserved, remote, and rural communities working to increase their knowledge in a specific healthcare area so that they can provide necessary care to patients in their communities. CLICK HERE.